We can help you create a luxury aesthetic in your home. It’s easier than ever to customize your home and create a luxury aesthetic with wood veneers by Sauers & Company Veneers. Wood veneers are created by adhering thin pieces of wood on top of a solid material, to resemble solid, natural wood. Sauers’ wood veneers are created from the finest trees available from around the world. 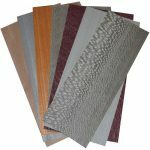 Wood veneers can be used in doors, paneling, flooring, and in furniture. While many people assume that wood veneers are of a lesser quality than solid wood, that’s not necessarily the case. While solid wood grains may be rarer, wood veneers offer boundless creative options and are often used for high-end furniture, as they are more resilient than solid wood grains, which are prone to splitting in certain conditions. Today, wood veneers are used to create a specific aesthetic that may be hard to find in natural wood grains. When it comes to custom selection, wood veneers offer versatility with design that allow you to showcase your personal taste with a wide range of patterns and designs. At Sauers & Company Veneers, we offer over 125 species and 6 backing options for wood veneers for boundless options to customize your project and achieve a luxurious look that reflects your tastes in your New York City home. Call us today to discuss your project and find the exact finish you’ve been dreaming of with the highest grade of wood veneers available on the market.